Discussion in 'Online Casino Promotions' started by Marina, Jun 30, 2014. Thrills Casino has an exciting promotion for their players this summer! 50 days of summer at Thrills! It started on 27th of June and runs until 15th August 2014. There are free spins, deposit match bonuses, challenges and more all summer long at Thrills Casino. Please know that if you have played at Thrills before, it's a fairly good chance that you will find something much juicer in your daily offer. at least 5 free spins (no deposit) on the video slot Enchanted Crystals. It can be that you even get more free spins. on Enchanted Crystals during the Happy hours. So make sure to check daily by logging in to your Thrills Casino. Happy hours between 19.00 - 23.00 CET on Enchanted Crystals. Minimum 5 Free Spins. Everyone who makes a deposit before 15:00 CET will instead get 40 Free Spins. Min deposit €20. Deposit €40 and play 200 Spins (€0,50 min bet) to get 40 Free Spins on Mega Fortune the following at 13:00 CET. Deposit €30 and play with €50! and you also get 50 free spins on Starburst the day after your first deposit. Just sign up for an account at Thrills, make a deposit of €20 or more and use the bonus code Welcome1. Your deposit will be doubled instantly and 50 free spins will be in your account the following day after 11:00 CET. Terms and Conditions from Thrills Casino apply. That are some great promotions Marina! The reload bonus is still valid! I really love the freespins at Thrills Casino because the winnings are cash and not Bonus money. 50 Days of Summer continues at Thrills Casino! Listed below are the default offers, it may be that some players even get bigger bonuses. It depends on your activity at Thrills Casino. 30% bonus up to €30 as a minimum and a much more juicy deal for the more active players as always. Deposit €50 and get 50 Free Spins on Twin Spins. Hit the bonus round 3 times on either Jack and the Beanstalk or Gonzo's Quest and you will get 20 Free Spins. 50% bonus up to €30 as a minimum and a much more juicy deal for the more active players as always. Today you are able to get 50 Free Spins for a deposit of €50 at Thrills Casino! Here are again the promotions for the next few days for the 50 Days of Summer promotion at Thrills Casino. Don't forget, below are the default offers, it may be that you get even bigger rewards and bonuses. Jack and the Beanstalk or Gonzo's Quest that is credited the following day at 13:00 CET. Spin 10 Rounds on Live Roulette and get 30 Free Spins on Starburst the following day at 13:00 CET. T.G.I.F starts off with a 67% reload boost up to €20 and finishes with happy hours between 19.00 - 23.00. ALL players get a total of 5 spins that they can play on either Jack and the Beanstalk or Gonzo. Good times! Hit the bonus round 3 times on either Jack and the Beanstalk or Gonzo?s Quest and you will get 30 Free Spins. However, Free Falls and Free rounds won during Free Spins do not count towards the challenge. Deposit €20 and get 30 Free Spins on either Jack and the Beanstalk or Gonzo's Quest Or make it bigger and get 125 Free Spins instead if you deposit €100 or more. 34% up to €25 as a minimum and a much more juicy deal for the more active players as always. Wednesday 16th of July - Mystery Gift! Deposit as much as you can and we give you a mystery gift. The more you deposit the better gift you get! and you get the next day 30 Free Spins! Deposit today €20 in your Thrills Casino and collect 20 free rounds on Jack and the Beanstalk or Gonzo's Quest. You are able to get 125 Free Rounds on the NetEnt Slot Jack and the Beanstalk or Gonzo's Quest when you deposit today €100! More awesome promotions from Thrills Casino! Deposit between €10 and €25 and get a 33% match bonus on that deposit. Day 34 - Wednesday 30th of July - Mystery gift! On this day you are able to get a mystery gift. The more money you deposit how better the no deposit bonus will be. Day 35 - Thursday 31th of July- Deposit = Get free spins! This day you are able to collect Free Spins. Deposit 20 Euro and you will get 25 Free Spins on either Victorious or Secret of the Stones. Deposit €100 and you will get 125 Free Spins! Deposit between 10 and 20 and collect a 67% match bonus for that deposit. Deposit on this day 100 Euro and you are able to win a PlayStation 4! Day 38 - Sunday 3rd of August - Deposit = Get free spins! This day you can earn your self 75 free spins on either Victorious or Secret of the Stones. You have to make a deposit of €50 in your player account. Lets claim a reload bonus on your next deposit. Deposit €25 and get a 33% match bonus. It is Saturday 2nd of August 2014, and today Thrills Casino is giving away a PS4. So join today the PS4 Raffle at Thrills Casino. Deposit today €100 in your player account and you earn yourself a ticket in the Raffle for the PS4. The winner will be notified by e-mail from Thrills Casino the next day. It is Sunday 3 Augusts and today at Thrills Casino you can earn your self a hand full of free spins on the NetEnt Slots Victorious or Secret of the Stones. Deposit €50 in your player account at Thrills Casino and 75 Free Spins will be credited on the Slot Victorious or Secret of the Stones. You can choose the Slot your self where you would like to play your Free Spins. Between 19.00 and 23.00 is it happy hour at Thrills Casino. Get unlimited 67% reload bonuses up to €20 Free. Active members are also able to claim 5 Free Spins on the cool NetEnt Slot EggOMatic or Elements. Day 42 - Thursday 7th of August - Deposit = Get free spins! Earn yourself some free spins! Deposit 20 Euro en collect 25 Free Spins on the Slot Elements or on the Slot EggoMatic. Deposit 100 Euro and get 125 Free Spins! Reload your wallet by depositing up to 25 Euro and get for that deposit a 50% match bonus! Day 44 - Saturday 9th of August - Deposit raffle! Thrills Casino is giving away again a PS4 or a XBOX. Deposit €100 and you earn your self a ticket. The winner will be informed by e-mail or Phone from the 24/7 customer support. Day 45 - Sunday 10th of August- Deposit = Get free spins! Today you are able to get 50 Free Spins! Deposit €50 and get 50 Free rounds on Elements or EggOMatic. If you are able to get 3 times the Free Spins Bonus on the Video Slot Elements or EggOMatic then you will get the next day 25 Free Rounds. When you hit 5 times the Free Spins, you can get 50 Free Spins. Get on your first deposit on this day a 30% reload bonus up to €30! Day 48 - Wednesday 13th of August - Deposit = Get free spins! It is Free Spin day for all players...Deposit €50 and get 50 Free Spins on either Elements or EggOMatic. Day 49 is a very special day. Deposit for a mystery no deposit bonus. The more money you deposit how higher the no deposit bonus will be. Sounds great not? 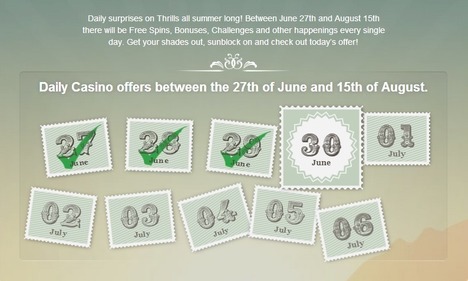 Day 50 is the last day of the summer promotion from Thrills Casino. All players are receiving 10 Free Spins on the Video Slot Elements or EggOMatic. Today you are able to get Free Spins at Thrills Casino. Deposit €20 and get 25 Free spins on the Elements or on the Slot EggoMatic. Deposit €100 and you'll get 125 Free spins on the Elements or on the Slot EggoMatic. Thrills Casino is giving away a PS4 or a XBOX today only! You need to deposit €100 in your player account and turnover this amount at-least one time...and you earn your self a ticket. The winner will be informed by e-mail or Phone from the Thrills Casino 24/7 customer support.